Are you full of social media questions? Social media has skyrocketed in popularity over the years. It has completely revolutionized the way we communicate, making it possible to reach virtually any person from all around the world in a matter of seconds. In fact, in 2010, the total number of global social media users were at 0.97 billion, while in 2018, it is estimated that the total number of global social media users will reach 2.62 billion. On top of that, as a result of an increased use of social media, new social media platforms that enables new forms of communication has appeared. These platforms have helped attract an even bigger audience to social media, for instance by making it possible to send videos, photos, or voice recordings. With the quick pace of social media’s growth and the immense number of users that social media has acquired, naturally, plenty of questions about social media are asked and are continuingly being asked. In this article, I am therefore digging into the most common social media questions and questions about social media usage, and give you the answers to them. Remember that for this article, though, I’ll focus on social media usage in general, and not mainly social media for marketing – even though some question regarding marketing will find their way into this post. 1.Do you have to use every single social media platform? Today, there are several hundred social media platforms you can choose from, and as a result, the question about which social media platforms you should use, if you should use all, and which platforms are better are some of the top questions when it comes to social media. To answer your question, no, you do not need to use every single social media platform, because if you would, you’d simply be running out of time. And if you’re using social media for marketing, you’d end up generating average or below average results across many platforms, rather than generate incredible results on a few. A common misconception is that the more social media platforms you’re on, the more people you’ll be able to reach, and in theory, that is true, because you have the ability to reach a bigger audience, however, it is better to generate amazing results on a few platforms than ”eh” results on many. Moreover, if a social platform has 100 million users or even a billion users, you will never, no matter what you do be able to reach all of those people anyways. 2. Should you be consistent with your social media posting? Yes. when it comes to social media, consistency is key. If you want to build your social media, consistency is a crucial part, and if you stop for a while, you’ll lose momentum. By posting regularly, you show people that you are serious about social media and that you don’t plan on leaving anytime soon. Moreover, if you stop posting for a while, people might believe that you have stopped using social media, and if that is the case, there is no real reason for them to follow you, right? For brands, not being consistent can be devastating. In fact, your social media can then have a negative effect on your brand instead of being beneficial. Imagine if a customer that plans on buying from you goes to your social media account to see what you are up to, just to see that you haven’t posted for a week, or even a month, it sends signals that you might have quit or even gone bankrupt. And do you think they’ll buy from you then? And lastly, if you aren’t consistent, there’s a risk that people will forget about you. A tremendous amount of content is being shared every single day on social media, and while you aren’t posting consistently, your competitors are, which can result in your audience forgetting about you and remembering about your competitors. 3. Should my social media handles be consistent? If you have several social media accounts, ideally, you should have the same handle on all of them. 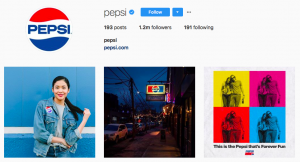 Because if I follow, let’s say Pepsi, on Instagram, whose handle is @pepsi, and then decide to look them up on Facebook, what do you think I’ll search for? @Pepsi, of course! By keeping your social media handles consistent across platforms, you make it easier for people to find and mention you. If you have complicated and long handles that are all different across your platform, you make it tremendously for people to remember your username, and find you. Sometimes, it isn’t possible to get identical handles across all social media platforms, and if that is the case, you want to try and make the username as similar as possible, while at the same time avoiding unnecessary dots, underscores, and numbers. 4. What Type of Content Should I share on social media? This is a big question, but the best answer is the type of content that your audience wants to see, the content they will resonate with, and find appealing. The reason people follow you on social media is that they want to see your content. There’s not a lot of other reasons for them to follow you. And the way you build a strong audience and following on social media is sharing content that speaks to your target audience and gives them a reason to follow you. This is why it is so tremendously important to know your target audience and what speaks to them. If I am sharing all types of content that isn’t related nor coherent, I’ll have a hard time building an audience, because I am not speaking to a particular audience – I am aiming too wide. But by knowing what my audience finds interesting, and what type of content they want to see, I can optimize my content strategy to only include that type of content, and thereby attract a larger and more targeted audience. The content you share on social media is your value proposition, so make it a good one. If you know people in your industry are struggling with learning how to do something, take the opportunity to create content that teaches them! If you know your target audience is passionate about traveling and want to be inspired, then share dreams travel images and videos. It all comes down to knowing your audience to be able to know what type of content you should share on social media. 5. 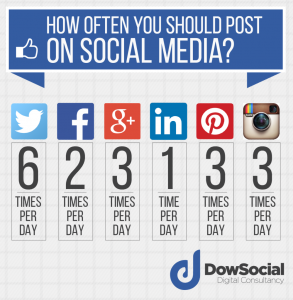 How often should I post on social media? The boring answer is that it depends. But let me elaborate. Firstly, the ideal number of posts you should share depends on your target audience. After all, it is for your target audience the content you share is dedicated to, and therefore, you should share the number of posts they want to see. These numbers are great as a starting point, but you need to bear in mind that they aren’t set in stone. The best advice I can give you is to try. Try sharing lots of posts, and try sharing few. That way, you’ll be able to get a sense of your ideal number. A general rule that goes for all social media platforms, though, is that you should share at least one post daily. This will keep you on top of your audience’s mind and never forgotten. Moreover, and this is probably the most important part, what’s even more important than the number of posts you share is the quality of the content you share. As the number of social media users has skyrocketed, so has the amount of content. This means that today, the competition is tougher than ever, and this means that in order to stand out, you should compete with quality, not quantity. Becuase low-quality content does absolutely not cut through the noise. Therefore, if you can produce a maximum number of one post a day, then do that. But if you are going to stress with creating two pieces of content, and that leads to compromised quality, you’ll be better off just sharing one piece of content. 6. When is the best time to post on social media? Another boring answer: it depends. But this answer is more based on the circumstances and your audience than anything else. And the answer is a lot more practical. As you might have been able to guess, the answer is that it depends. If you search, you’ll be able to find several different answers that give you an exact number, however, you need to be very careful with taking those numbers like they are set in stone because the ultimate times to post depends on several different factors, and they are far from same for everyone. I recently wrote a post about the misconception about the best times to post on social media, and if you are someone who is wondering that, I think you’ll find it eye-opening. The thing that will have the biggest impact on the best time to post for you is obviously your audience. And that is decided on when your audience is most active. But something also worth having in mind is that the time you post on social media is not as important as it was a few years ago. In other words, there’s an abundance of content on social media, and as a result, most social media platforms have started using different algorithms that try to decide which the most relevant content is to you, and then present that in your feed. But when the algorithms weren’t around, the most recent pots were presented at the top of your feed, and then pushed further and further down as new posts were shared. And this is why you wanted to share a post at the time when the majority of your followers online, because doing so would increase the chances of them seeing it. But today, as most social media platforms are using algorithms, the times of which you share posts isn’t as important as it once was, but that is not to say that the time of which you share your post is completely irrelevant, because many of the algorithms use time as a ranking factor. To know when the best time for you to post is, therefore, to get to know your audience’s social media habits. Some social media platforms have built-in analytic tools that show you when your audience is most active, and if not, there are third-party tools you can use. 7. How do I get more followers on social media? This is another huge question that could be answered in a very practical way or a more general way. And since the way you build your audience depends on several factors, an important one being which social media platform you’re using, I’ll answer this question more generally. The answer on how you grow followers on social media is by understanding the reason why people decide to follow you on social media and then doing that. And as I talked briefly about earlier, the most fundamental factor for this is the content you share. Because the content you share will work as your value proposition and the reason that people are going to follow you. People follow you because they want to see your content in your feed, right? But if they don’t find your content interesting or appealing, they have no reason to follow you. And I just want to add that too many people focus on their follower count on social media. It has become an obsession for many people, but what truly matters is the quality of your followers and if those followers are actually relevant to you and your brand. The number in your profile doesn’t mean anything. It is what that number potentially resembles (if done right) that matters. This is the reason why buying fake followers is such a bad idea, because you’re getting nothing but bots – empty shells, as followers. Your content is the most important part to growing your followers on social media, and as more and more content is being shared on social media with the increased number of users, you need to give people a reason to follow you rather than your competitor. What is unique about your content compared to your competitors? What do you share that others don’t? When you share something that few can compete with, whether it be exclusive insights or just content that holds much higher quality than everyone else, that’s when you’ll succeed. And remember, it is a bad idea to start using practical tips on how you’re growing your social media followers if you haven’t laid the foundation – which is, in fact, your content. 8. Does Social Media Affect SEO, and how? This is a social media question that has gotten more and more asked in recent years, as social media has skyrocketed in popularity, but also as more and more people have realized the power of SEO. And the answer is that social media is a site, just like any other, which means that Google will index and scan it as long as it is able to, but the impact it has on SEO is more indirect than direct. But something that is also worth having in mind that since Google is seeing that the number of people who are using social media is increasing, and the time people spend on social media likewise, they can’t neglect something that takes up a large part of people’s internet usage forever. This is also why they have admitted that they will probably use social media as a ranking factor in the future, but today, it is only affecting indirectly. A reason for this is that Google knows that it is tremendously easy to buy fake followers and fake engagement, and if Google would use things like followers on social media as a ranking factor, not only would people fake it more, but it would also be easy to trick Google by faking popularity. There’s a misconception that links, for instance by Facebook gives your site a backlink, but this is not completely true. While Google indexes this, it won’t be a do-follow link that brings your site any backlinks. What google more looks at is popularity for instance if you get tons of social shares, which can show that people enjoy your content a lot. And if you’re using social media to increase awareness about your content, that can, in turn, lead to more actual backlinks from other sites. Moreover, social media can be used to build relationships with people, such as journalists and bloggers, which can lead to partnerships, guest posts opportunities, which in turn can lead to SEO benefits. Does social media affect SEO? Here’s the truth! 9. Can you measure the ROI of social media? A common question that marketers ask is if it is possible to measure the ROI of social media. There’s a misconception among a lot of people that it isn’t possible to measure the ROI of social media, but those who are saying that don’t know how to do it. Because the truth is that social media ROI can be measured both qualitative and quantitative. It’s just about knowing how you do it, and what it is you should measure. Sure, measuring certain metrics from social media, such as brand-awareness might be tricky, but at the same time, it is equally tricky to measure metrics like those on other marketing sources. 10. What’s the ROI of social media? This is a tricky one because the truth is that the ROI of social media depends on how you use it. The ROI of a golf club is not a lot for me (even though I wish to believe that I am good), but the ROI of a golf club for Tiger Woods is millions, maybe even billions. Social media marketing has shown to be able to generate incredible results for marketers, which you can find in this complete social media marketing statistics list, but at the same time, unless you don’t know how to use it and have a strategy for how you’re going to leverage social media to generate marketing results, the ROI of social media will be very low. This is why it is so tremendously difficult to say an exact ROI of social media because it depends on how you use it. Social media is a tool that has the potential of driving an amazing ROI. To be really practical, the ROI of social media is the amount you earned in your social media campaigns, minus the amount you invested. 11. My brand is in a boring industry, or is a ”boring” company, should I use social media? Even if you are in a boring industry, it’s not that sure that your target audience will find your brand boring. Social media isn’t just a place for lovely scenery shots and cool fashion images but it is also a place for regular companies in ”boring industries” or niches. Social media is a tool for you to reach your target audience and build relationships with them, and as long as your target audience is to be found on social media, you should be using it. And considering the immense number of people who are using social media, most brands will find their target audience there. Only a few brands might not find social media effective – for instance, if the target audience consists of 80+-year-olds. No matter if you’re in a boring industry, or a brand that is considered boring, you can still find tremendous success, under the condition that your target audience is there, and that you have a fun and engaging strategy. 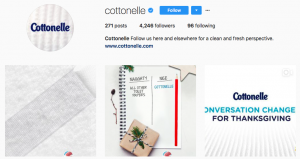 Take Cottonelle as an example. It’s a brand that sells toilet paper. Not a very exciting brand, yet still, they have successfully implemented social media into their marketing strategy and been able to engage their audience. And since toilet paper is quite a universal products, a lot of their customers are to be found on social media. 12. 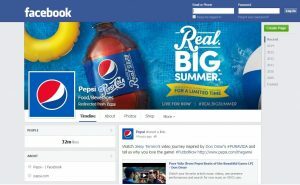 Can I share promotional content on social media? This is an interesting social media question, but a very common one from marketers and the answer is yes, but you should do so moderately. Your goal with your content is to provide your audience with value. And as you know, value can come in all different forms, such as information, knowledge, entertainment, to name a few. The content you share is your value proposition and the thing that will attract people to you and ultimately get them to follow you, absolutely, but at the same time, as you’re growing your social media an get a target audience, you obviously want to take advantage of it and promote to them. And that includes sharing promotional content. You can share promotional content on social media, but you should do so moderately. If you can share promotional content that brings your audience value at the same time, you’re onto something, but if you can’t, a rule that is often spoken about is the 80/20 rule. 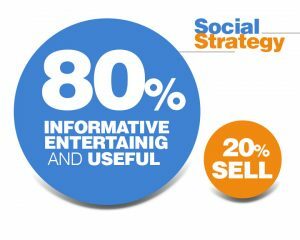 This means sharing 80% content that provides your audience with value and 20% of content that is promotional. Some marketers believe that the only way to generate marketing results is to share promotions on social media, but that s not necessarily the case. Because as you’re growing an audience, you increase brand awareness, as well as build stronger relationships with them, which will lead to loyal supporters of your brand – something that is incredibly valuable for brands. Remember that there’s a ton of content being shared on social media, and people don’t go there to have ads shoved down their throats. They go there to have a good time and interact with people. And if you start posting ad after ad, boring posts which bring them no value, the unfollow button is not far away. And since there’s a lot of content out there, there are a lot of other places they can go to. 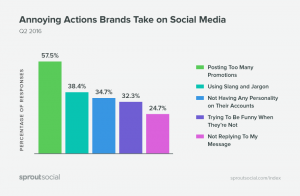 A study found that posting too many promotions is the most annoying action brands take on social media. Moreover, the study also found that 46% of people will unfollow a brand for sending too many promotional messages. 13. Should I outsource my social media marketing? There is no real answer to this question. The only answer is that it depends. Managing a successful social media strategy that actually brings you results demands time, energy, and money, and if you as a brand don’t have all of the resources in-house for doing all of that, outsourcing might be a good idea. 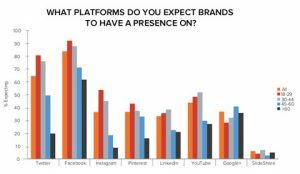 As social media has become a natural part of many brand’s marketing strategies, the number of social media agencies has increased to meet the increased demand. If you’re ever in need of social media managing services, don’t hesitate to reach out to use at Veloce for help. You can email me at Jens@velocenetwork.com and I’ll personally assist you. There’s a lot to know about social media marketing, and as mentioned earlier, social media is an effective tool, but only if used in the right way. If you aren’t that knowledgeable in social media, it can definitely be a good idea to outsource help for your social media marketing efforts, because setting up your account and sharing a few posts is far from enough if you want to generate results worthwhile. 14. Which social media channels are the best for my business? The answer is: where your target audience spends their time. But that is not the only answer. The real answer is that it depends on a number of factors. Obviously, there is an immense number of social media platforms out there, and this can make deciding rather tricky. And as I talked about earlier, it is better to focus on a few social media platforms and generate incredible results than to spread your efforts and generate average or below average results on many. Firstly, the social media platforms you select depends on where your target audience spends their time the most. Your goal with social media is to reach your target audience, so therefore, there’s no real point in, using social channels where your audience is nowhere to be found. For instance, Pinterest is a social media platform where the majority of the users are women, so if you’re a brand that has men as your target audience, Pinterest may or may not be the best platform for you. Therefore, when deciding which social platform you should use, ask yourself: ”where does my target audience spend time on social media?”. Furthermore, you should also look at the user demographics of the different social media platforms to get the facts. Another important factor to think about is content. Obviously, not all social media platforms are created equal, which I mentioned earlier. Some platforms are focused on videos, for instance, YouTube, some platforms are focused on images, for instance, Pinterest and Instagram. And you obviously want to focus on using platforms that best support your mission, but most importantly your capability of creating different types of content. If you aren’t that great at creating amazing videos, then YouTube might not be for you. But if you are awesome at creating stunning images and presenting your brand and products is unique and engaging ways, Instagram might be a good platform to use. But that is only under the condition that your target audience is to be found there, too. If your objective is to show people how your product works, to fully immerse your audience into it, you probably want to use a social channel that supports video, and if want to use social media to build relationships with your audience, then choosing a channel that supports that objective is a good idea. 15. Should I follow people who follow me, back? Only if you actually want to and if you find the content and account of the person who followed you interesting. You definitely don’t want to follow people who followed you back just for the sake of following, because that ”follow” isn’t genuine. It isn’t authentic. You know the reason why people follow you, and the same should go for the people you follow. A common growth strategy that is highly debated is the follow/unfollow tactic, which means that you follow someone in hopes on them follow you back, and then unfollowing them, and you don’t want to be following back people who follow you just for that exact reason. Therefore, you should have a policy to only follow the accounts that share amazing content and content that you genuinely care about. Remember: if you just follow every account that follows you, you’ll end up with a bunch of irrelevant content in your feed. 16. How much does social media cost? Social media itself doesn’t cost anything. It is free to use and you can use it as much as you want. However, if you’re going to use it as a brand, you’re going to have to pay for people to create content, build your presence, engage with your audience, deal with customer service questions, and much more. And that is going to cost you, but the social media part is not going to cost you anything. Moreover, social media platforms offer the ability to advertise on the platform, and if you’re going to do that, it is going to cost you. The best part about this is that for many social media platforms, you yourself decide how much or how little money you want to invest. If you’re going to pay for ads on Facebook, for example, you can invest as little as a few dollars, but you can also invest hundreds and thousands of dollars. If you’re a one-man show, social media doesn’t have to cost you a single buck, and with the help of organic reach and clever tactics, you can actually generate quite amazing marketing results by only relying on organic reach. 17. How do I know if social media is effective for my brand? This is a tricky one, and it all comes down to measuring the ROI of social media. As mentioned earlier, it is both possible to measure social media, and social media has the potential of generating an amazing ROI. But if you invest all of this time, effort, and resources into social media, you obviously want it to be beneficial for your brand. This is why measuring the ROI and results of social media is an important part of that. Depending on which metrics you’ve focused on, there are several ways to go about measuring the ROI of social media, but in this complete social media ROI guide, you’ll learn all about it. 18. Should I invest money in ads on social media? As mentioned earlier social media can generate amazing results organically, but if you’re going to rely solely on organic, you’ll have to invest a lot of time and energy. If you want to get your social media marketing on steroids, paid advertising is the way to go. While organic reach is still fairly high on some platforms like Instagram and Snapchat, it is decreasing as more and more content is being created and shared. For Facebook, it is sometimes talked about a close to zero percent engagement, as a result of the ever decreasing organic reach. Ads on many social media platforms have shown to be able to generate amazing ROIs, as a result of the advanced targeting they offer, that makes your ad laser targeted to the people who truly matter to your brand. In fact, even if you don’t use social media normally for marketing, social media ads are effective for almost all types of business, and at the low cost they are at today, you are missing out if you aren’t leveraging them, because as the organic reach is decreasing, and as more brands start using ads, ads will only increase in cost. 19. How can I convince my sales leaders or CEO that we should use social media? This is a very common social media question that is being asked by people and marketers who are devastated by the fact that their boss doesn’t want to start using social media marketing. And in today’s landscape, it can feel like unless you don’t have a social media presence as a brand, do you even exist? But the thing is, it’s not about ”can you survive without social media?”, because you can. It’s about how much more can you make with it? And how much money are you leaving on the table if you don’t use it? If you want to convince someone about something, you need to begin by presenting the benefits of it, and the reasons for using social media. If you want to have a more practical and easy to understand example, you can take your competitors’ social media presence as an example and show how beneficial social media is for them. Moreover, you can also present the number of messages that you’ve received from your audience, asking you to start using social media. Because the truth is, many of your customers expect you to be on social media, and if you’re not, you’re missing out on valuable opportunities to engage and build relationships with your audience. Moreover, you also want to show them how many of your prospects that are using social media. Because by doing so, you show them the many benefits, you are that they are missing out on. And if you know the human psychology, humans hate feeling like they have missed out on something. Social media is a large industry and space, and many of the brands and people hopping on to social media hop into an overwhelming, enormous world when they first start using social media. As a result, it’s not strange in any way that all of these social media questions are being asked, and hopefully, you found the answers that you were looking for. How many of these social media questions have you asked before? How many answers did you already know from the start? Share your thoughts with me in the comment section below!